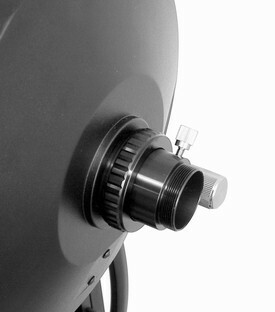 Meade Eyepiece Holder for LX200 & LX90 Telescopes. Allows any 1.25" accessory to attach via the rear cell thread. This also enables 1.25" accessories to connect to Meade focal reducers. Eyepiece holder "Visual Back" allows attachment of 1.25" accessories to SCT's. Large thumbscrew tightens down and holds 1.25" diagonals, basic camera adapters, tele-extenders, etc. in place. Meade Diagonal Prism #918A 1.25"